It happened like this last year...but there were fewer geese. 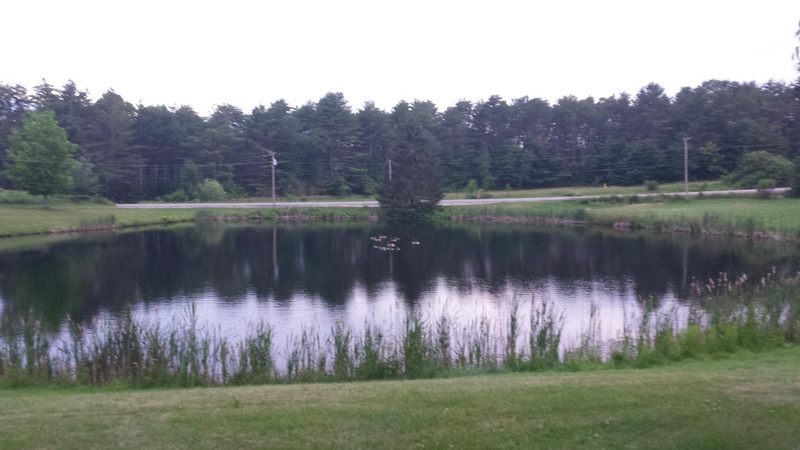 About the first week of June, two adult birds, walked out of the tall grass, separating the "wetlands" on one side of the property, followed by three gosligs, just old enough to get into the water. This year it is four adults and 9 goslings--no doubt, at least one has returned from last year, with family ir friends. They have been here the summer, since June. Flying lessons began yesterday. The adults coax the adolescents to fly down the slight slope into the pond, at the same time calling and honking, much as they will when they leave in a few weeks, or pass by on their way north or south. 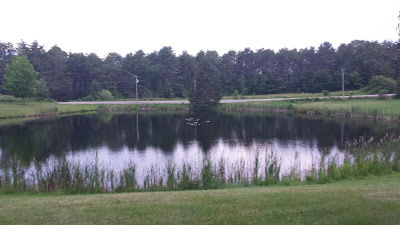 I like the idea of the geese on the pond, and they arrived shortly after Mr. Duck's demise and Mrs. Duck's return to the safety of a wading pool at a neighbor's home, so they filled the void of the duck shenanigans, but I've definitely cut back on swimming in the pond. I wonder how many will return next year and what we might do to deter them? The former owner had a large alligator head floating in the middle of the pond, and we all thought it was his sense of humor. It probably was to keep the geese at someone else's pond.